Professional chess players have a rather nomadic lifestyle. In the past, they used to travel from one place to another like the members of an opera troupe. They often travelled by train and played in four or five big tournaments in a year. There were tournaments in Baden Baden, Bad Pistyan, San Remo, Monte Carlo and many other beautiful places in Europe. Things have changed a lot since the days of Lasker, Capablanca or Alekhine. The players have a very busy schedule today since the number of tournaments has increased manifold. There are various types of tournaments for players of different categories. So in a category 20 tournament, only the supermasters are invited to fight against players of roughly equal strength. And even the beginners have tournaments where they face other newcomers. There is no need to be trounced by a far stronger player and quit the game once and for all! Chess is not an 'unjust' game in our times. A chess player's life is usually peaceful. But one must not forget that they, too, are influenced and affected by major global events. All the national teams of Europe travelled onboard the same ship on their way to Buenos Aires in 1939. The chess olympiad was held at a time when the threat of the Second World War was looming large on the horizon of Europe. The players were stuck in Argentina when Britain declared war on Germany on September 3. Many of them could not return to their country after the olympiad was over. This had happened before the First World War also. Frank Marshall and some other masters had to leave their baggage at a Mannheim hotel, as they rushed out for the first train going out of Germany. Miguel Najdorf, the Polish master, was in Buenos Aires when the bad news came. He had to wait for six years before he could return to Warsaw. Najdorf was not lucky like Marshall. It was no longer the city that he had known; his home had been razed to the ground. There was no trace of life! Where had his wife and beautiful little daughter gone? Najdorf never got an answer to his question. He went back to Argentina and stayed there for the rest of his life. 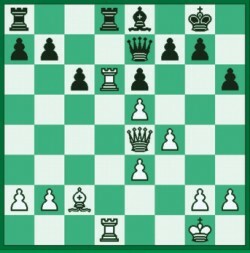 Here is a game played by Najdorf.